With endless options for colors, textures, and patterns, you can easily lend your bedroom a fascinating Mediterranean-inspired look. Inspired by a unique blend of cultures, modern Mediterranean style is a fusion of elements borrowed from Spain, Italy, Greece, and other North African nations. Although it instantly reminds of secluded courtyards and airy terraces overlooking the sea, the Mediterranean theme is a perfect choice for decorating serene, elegant bedrooms. With colors that mimic nature, warm textures, exposed wood and stone, mosaic tile surfaces, and ornamented décor, Mediterranean interiors are definitely captivating! Whether formal, casual, or rustic Mediterranean-style spaces exude warmth, comfort, and Old-world charm. 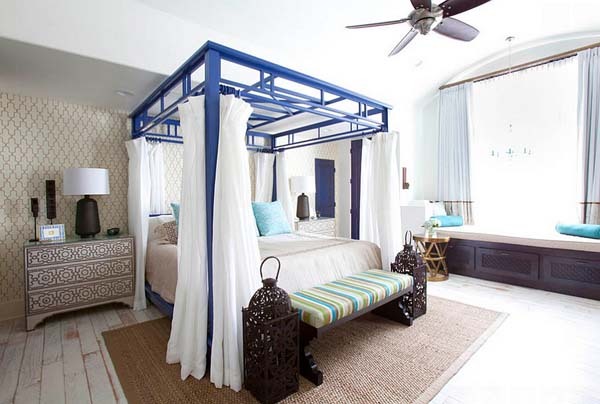 If you like this style, find inspiration and ideas how to lend your bedroom Mediterranean-inspired elegance. Mediterranean style is a fusion of several sub-styles. It is up to your taste and preference whether to opt for the classic, colorful Spanish style or the Greek one with its deep blues, turquoise, and plenty of white. 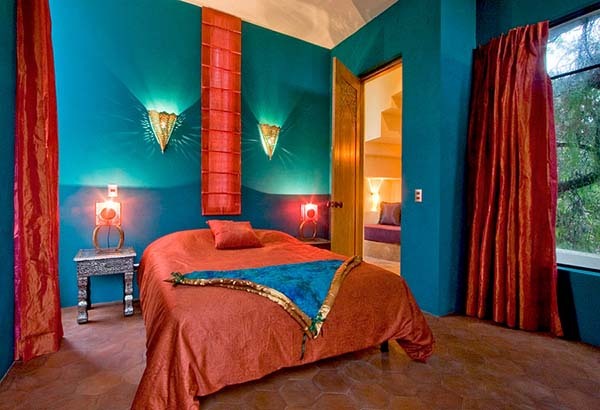 Still another option is to add to your space the old charm of Tuscany or choose some bold Moroccan elements. Because of their adaptability, neutral backdrops/or pristine white ones in the Greek sub-style/ are a safe and stylish choice. 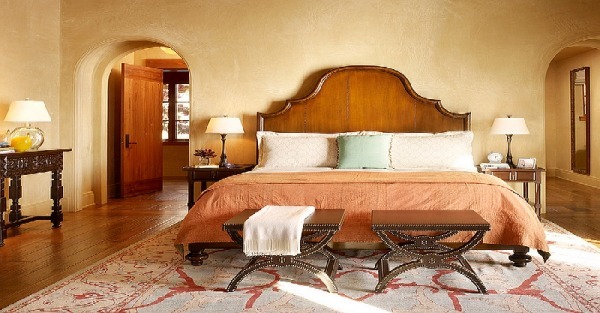 However, Mediterranean bedrooms look even cozier with vibrant, earthy shades. Plastered walls, rustic wooden accessories, and rich wool and silk textiles lend Mediterranean homes an opulent, luxurious look. If hand-painted tiles for the entire bedroom floor is a huge revamp, then try to add some mosaic accents or artwork with colorful tiles and cover the floor with a lovely Moroccan rug to bring in pattern and vitality. Wrought iron additions ranging from a gorgeous bed to decorative banisters and chandeliers are also typical elements of this style. If your bedroom is not well-lit, use glossy finishes and mirrored surfaces and replace heavier drapes with sheer white curtains to lend it an airy look. As nature plays an important part in all sub-styles, for an authentic look add potted plants.